This 4th of July was filled with tasty food, family, fresh mountain air and of course fireworks! And for fun we threw in some arm wresting, a chili cookoff, hiking and some kooky summer camp songs. Yes, I said arm wrestling. The ladies of my family decided to work off a few 4th of July BBQ calories with some with a little friendly competition. Grandma, Aunt, Mom, Cousin, Niece and I all made some good efforts...but it was my other Cousin that took the arm wrestling championship title! Nice job D! We followed up the arm wrestling with dessert...peach pie and berries with a cream cheese marshmallow fluff dip. Mmmmm. Rebecca of Buerrista selected this week's recipe. An excellent choice for 4th of July weekend! 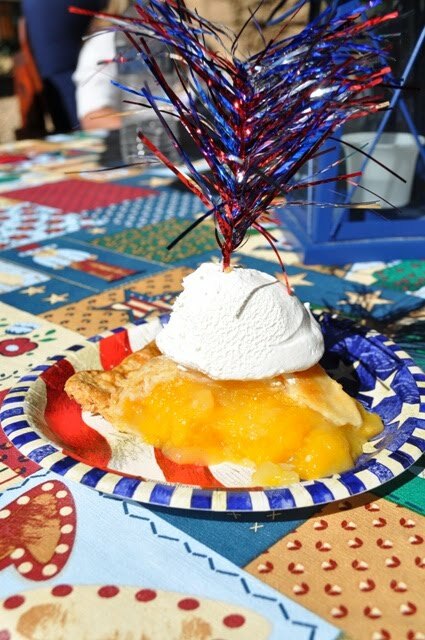 Who doesn't love pie on the 4th? 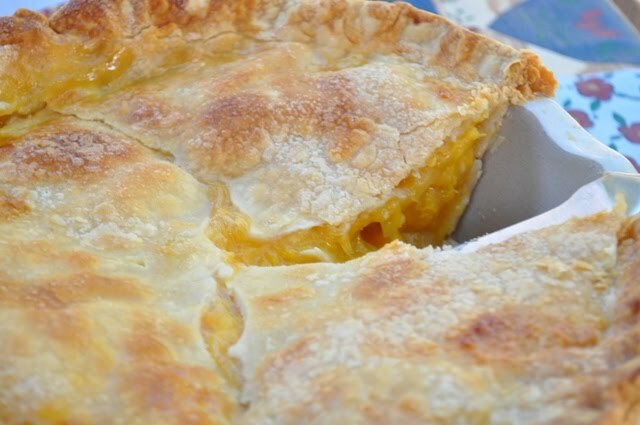 Check out Rebecca's site to see her beautiful pie and to get the recipe. To see the other tasty creations from SMS bakers click here. This was my first time making a baked peach pie. 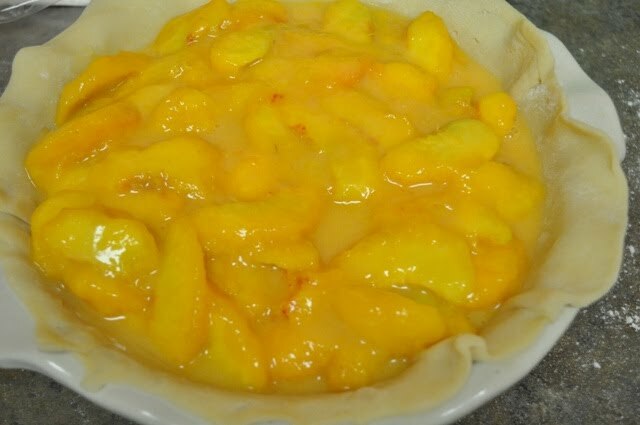 When I hear peach pie I think of fresh peach pie...with a single pre-baked crust filled with freshly sliced peaches coated in a sugary peach glaze and fresh whipped cream on top. The baked pie turned out ok. The filling thickened up nicely in the oven but the bottom pie crust was a bit soggy/underdone (only baked it for 1 hour and 35 min). I opted to leave the raspberries out and I cheated and used Pillsbury crust. We subbed flour for the ground tapioca pearls, which seemed to work out just fine. 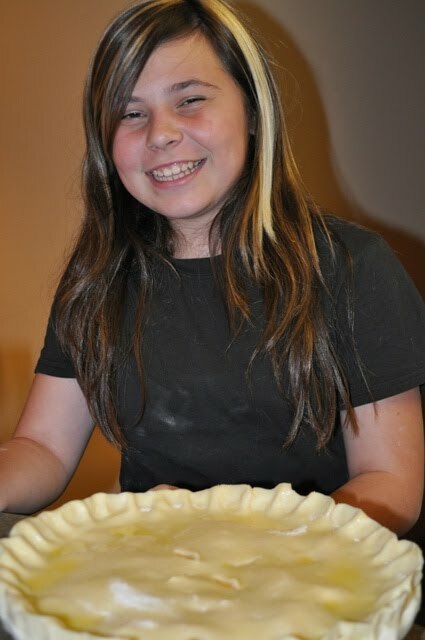 My niece was an excellent pie helper! I peeled the peaches and she sliced them all. Thanks for your help K! We served it the next day at our family BBQ and it received favorable remarks from the family. But you know, family isn't always an unbiased opinion. So I will tell you what I thought...I thought it was just ok, not great. My preference lies with a fresh peach pie. While peaches are still in season, I will give peach pie another go. Hope everyone had a Happy 4th of July! Arm wrestling! Sounds like fun! Pie looks good! What a fun 4th you had! Your pie looks fantastic! After tasting mine, I also promised myself to make peach pie again before its all-too-short season is over. I, too, made this pie for our guests this July 4th. They loved it! I think the raspberries really help, and add a nice bit of tartness. I also cheated and used Pillsbury - it's the best. I've never made a pie crust that I like as much. I am with you, not a holiday unless every minute is packed! Sorry you did not think the pie was exploding with fresh flavor (couldn't resist the metaphor =) . . . ) but the pie looks absolutely delicious. Great photos too! Sounds like you had a really fun holiday weekend Gloria! Your pie turned out beautifully. Sorry it wasn't a favorite for you, but it sounds like your family enjoyed it. I thought it was tasty, but I've never tried a fresh peach pie - thanks for the idea! Your pie turned out so beautiful - picture perfect.